Italy submitted its budget for review to the European Union on Tuesday, likely bringing tensions over the country’s spending plans to the fore. The budget proposes increasing both Italy’s overall government debt and its deficit in the short run, pushing the deficit as high as 2.4% of GDP over the coming years. This means Italy will fall foul of an EU-mandated maximum deficit level of 0.8% of GDP, and could lead to clashes between Brussels and Rome. Both leaders of the Italian coalition government are eurosceptic and a hardline from Brussels could stoke tensions. Italy’s government on Tuesday pushed the country closer to a showdown with the European Union after submitting its latest budget for review. “This budget keeps the government’s promises while keeping public accounts in order,” Prime Minister Giuseppe Conte said at a press conference. “Italy is a founding EU member and a net contributor,” he added, according to the ANSA news service. Matteo Salvini, the leader of the Northern League, one of the two coalition partners in the Italian government, said on Monday evening that the government plans to go ahead with the implementation of its budget proposals, regardless of any opposition from Brussels. Salvini’s belligerent attitude puts the EU in a tricky position. If it backs down and lets the Italians implement a budget in violation of rules it has set out, it risks a backlash from other eurozone countries which have abided by budget rules, often to their detriment. On the other hand, if it takes a hard stance and attempts to force the populist coalition into changing its budget, that could risk further alienating Salvini and his colleague, Luigi Di Maio, the leader of the Five Star Movement. 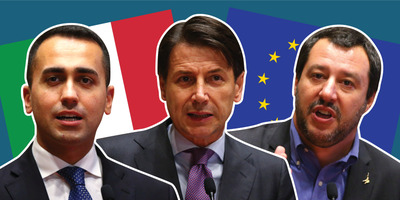 Official policy is that the government backs remaining in the European Union, but both Salvini and Di Maio are avowed eurosceptics, and Salvini is believed to privately back an exit from the single currency. In May, a leaked report, published in part by the Huffington Post, showed that both parties discussed a commitment to leave the euro prior to entering into government, before abandoning that pledge. The threat of a clash between Rome and Brussels comes as the Italian political situation continues to spook markets. Last week, Italian stocks briefly slipped into a bear market, and while they have rebounded a little, they remain subdued – although Italy’s benchmark share index, the FTSE MIB is more than 1% higher on Tuesday.